At Thanksgiving, when cauliflower is so very dear (and it’s supposed to still be in season), I’ll wish I’d bought a few extra heads in September. Made a little gratinee with lots of garlic, cream, and Swiss cheese. 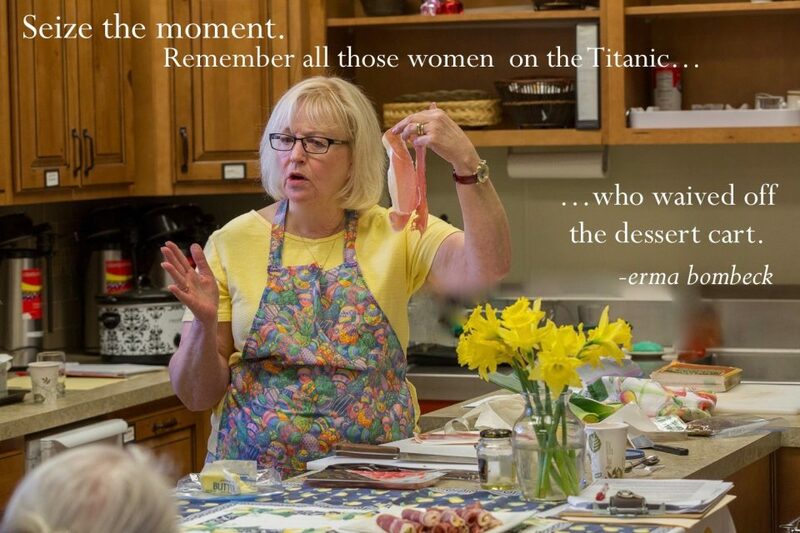 Thrown in an extra casserole for Jeanne. Maybe even made some cauliflower soup–even though it’s so very easy and is even good made with frozen cauliflower. Once in a while I get it all done, but not this year. The basement freezer isn’t bought, though it’s on the list (after paying the floor guy and the radiator repair guy) and I expect it’s not too far in the future. But right now, we’re eating what I cook and not putting much away for the winter. I did sneak a big bag of blueberries into the side-by-side and have a couple of on sale whole chickens (for chicken noodle soup) down in the bottom. I’m not much for raw cauliflower. I’m not saying I don’t eat it from the raw vegetable platter; I do. But the mealy, cabbagy sensation isn’t what I’m after; it’s not my favorite. But steam it, stew it, boil it, roast it, fry it and I’m all over it. I don’t care if it’s a bit crispy or grandma-done; I like it. This curried dish is a mix of two preparations. First you briefly steam it. Next you saute some sliced onions and garlic with curry powder. 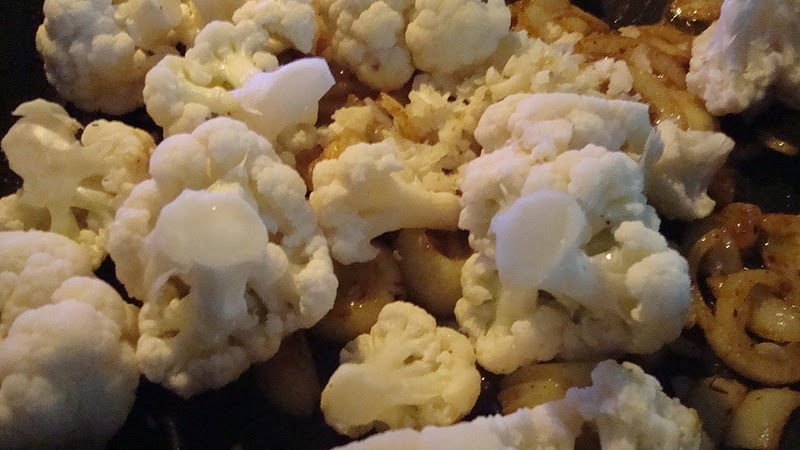 Then add the steamed cauliflower..
Stir and cook until quite golden and nearly tender. 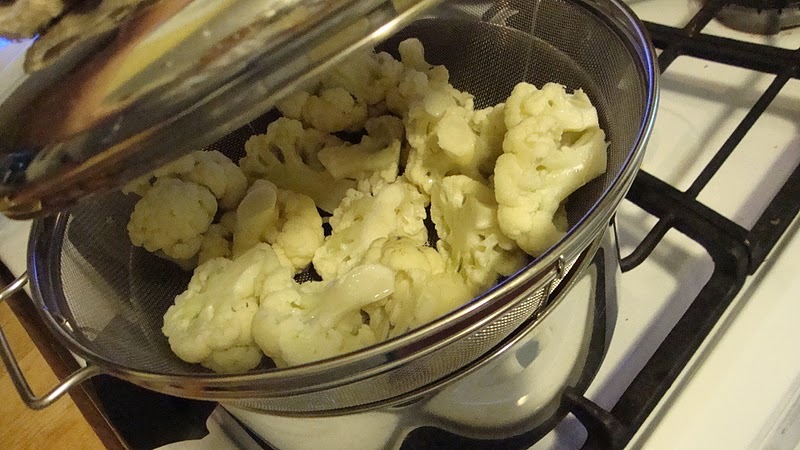 Steam cauliflower in a veggie steamer (or in the microwave) for about seven minutes, until just losing its crispness. 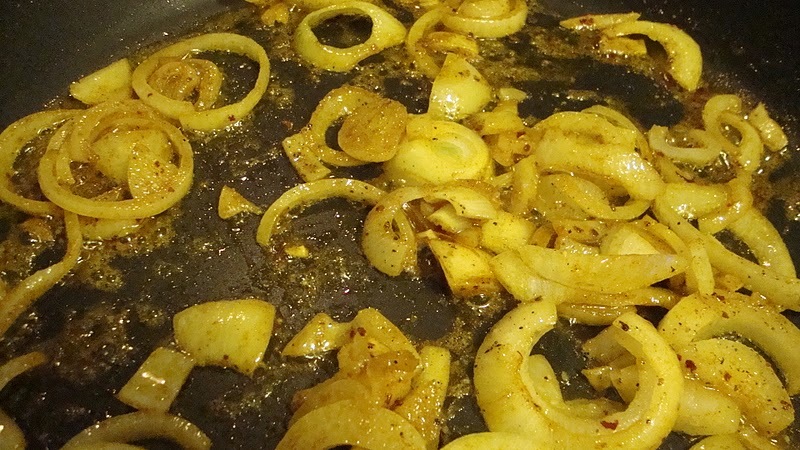 Meantime, in a large skillet, heat oil and saute onions for 3-4 minutes. Add garlic, curry powder and sprinkle with salt, pepper and ground cayenne, if using. Add steamed cauliflower and stir well. 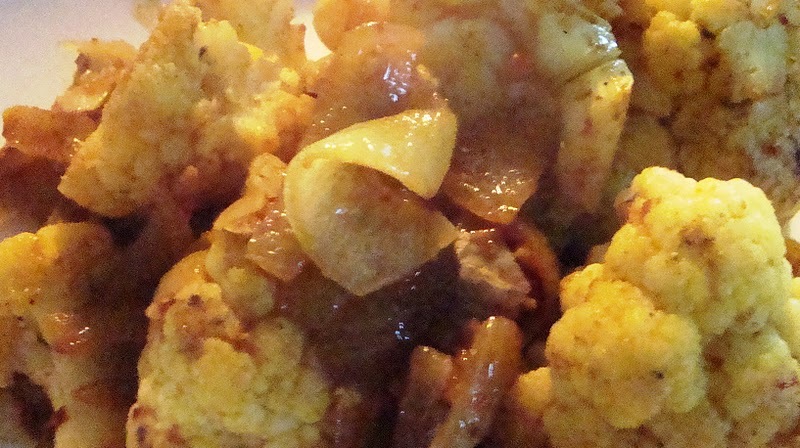 Cook over medium heat, stirring often, until cauliflower is nearly tender. Taste and adjust seasonings. (To increase cooking speed, add a couple of tablespoons of water to the skillet and cover for a minute or two.) Serve hot. At least that’s what I did. And walked the five steps to the dining room to eat it paired with a little steak Dave and I had. That’s as far as we can go because the couch is in the dining room, too, due to floor repair and refinishing in the living room. Where the piano is. Can’t get to the piano. Or the bedrooms. Or the front door. You could call it cozy. 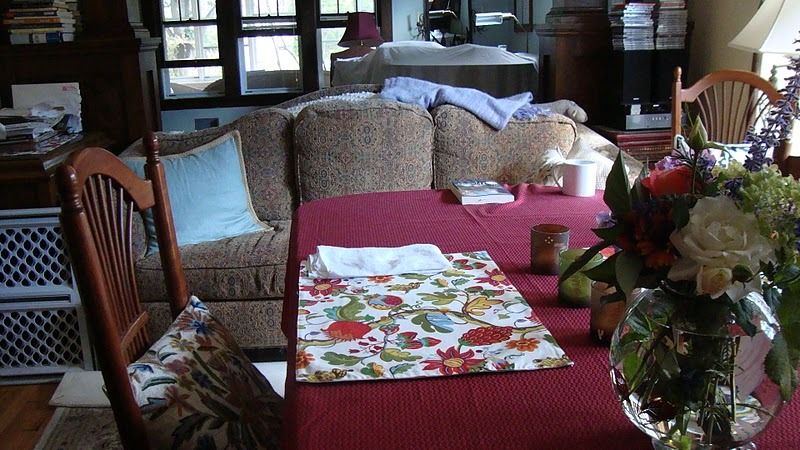 If I climb over the couch, and land in the perfect place, I can quickly scoot over and land on the piano bench. If. I haven’t tried it. 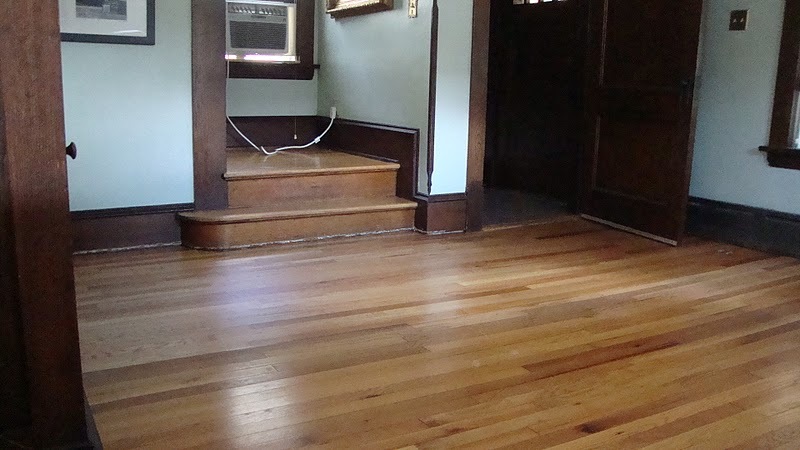 If we didn’t have dogs, we would be able to walk through the living room tomorrow. If. But we do have dogs, so we’re waiting until Wednesday. Sleeping in the basement where we can watch tv lying in our great (no, really, it is) sofa bed. 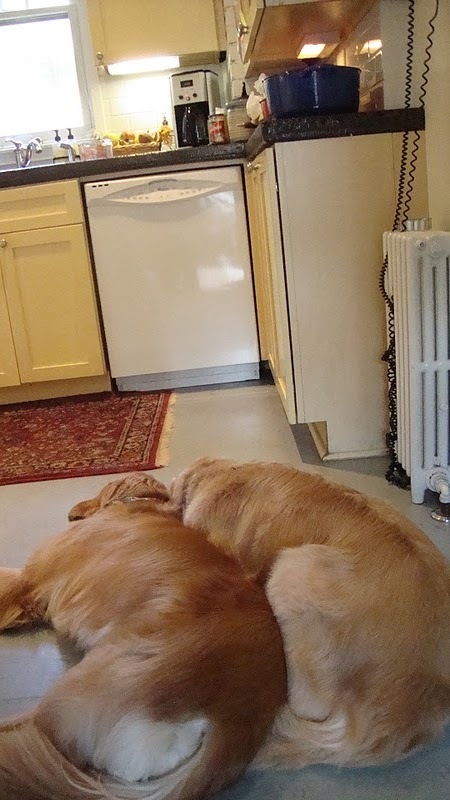 Next they’re tearing up the kitchen floor (6 layers?) down to the sub floor in order to lay a new wood floor. And, yes, the stove and frig must come out for a two week period. Ought to be interesting in our dining room; that’s where they’ll go. I love fixing up old houses, don’t you? Came home Friday to find Alvin running around the kitchen…. He jumped up in the window and I closed him in there. Quick thinking, huh? The floor guy, aka Bob, had left the door open. This chipmunk, aka Alvin, has been in our yard all summer, eating the painter’s lunches and jumping out into the path, scaring the crap out of us. 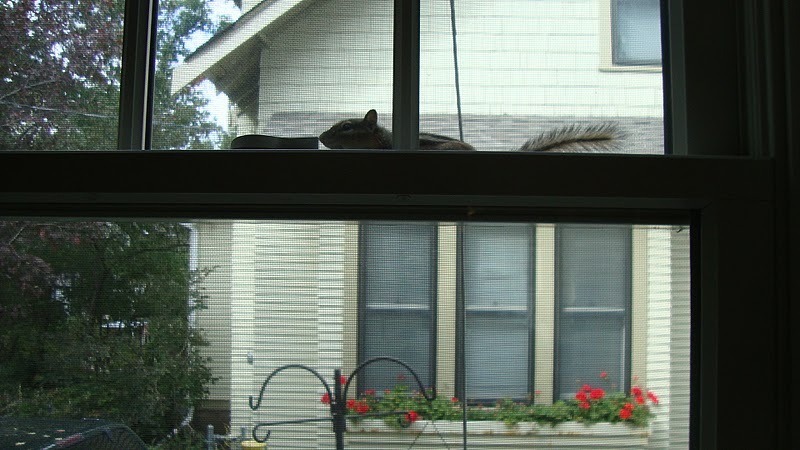 Our painter and friend, Chris, kept telling us that chipmunk was too smart for his own good and was going to get in the house. We laughed. Until Friday. 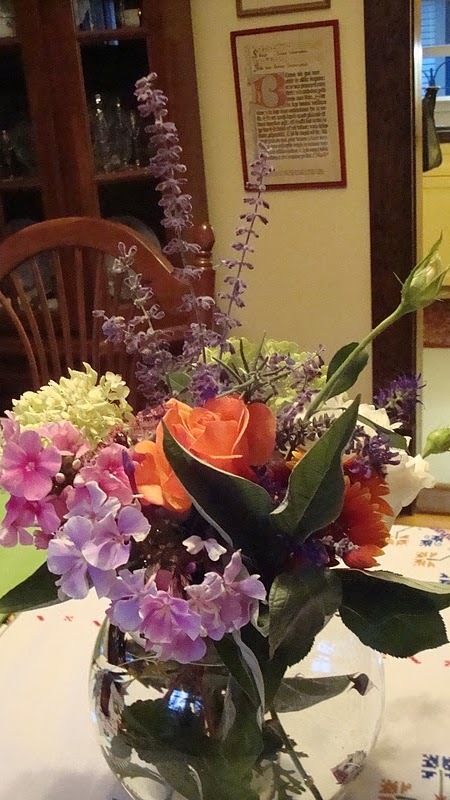 Still picking flowers from our yard. 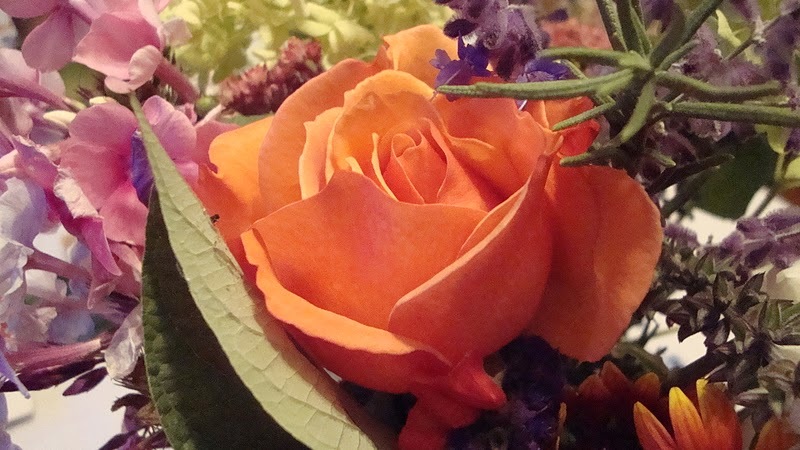 Not quite the last rose of summer, but nearly. Pie, me oh my: I love pie.